Did Moses really lead all those Hebrew children out of Egypt through the Red Sea? Find out with Dr. Gerald R. Culley in this 2-Part Good Answers Apologetics Presentation! 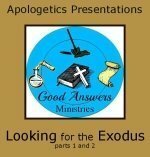 NOTE: Looking For The Exodus is made up of TWO separate presentations, part 1 and part 2. All components for BOTH are contained in this download.